The “Hermit Kingdom” has slowly embraced cell phones and cyberspace – on its own terms. Those expecting that technology will lead to a “Pyongyang Spring” will be disappointed. During the floods and famine of the 1990s, the North Korea regime was able to withstand the death of at least 5% of its population by forcing its poorest and least trusted citizens to bear the brunt of environmental disaster. Today, with one million cell phones in North Korea and a government sponsored intranet, the regime believes it can survive the advent of information technology by restricting its use to the most elite 5% of the population who have the largest stake in the survival of the regime as it currently exists. North Korea intentionally restricts access to information to control its population. TV and radios in North Korea are hardwired to only receive government controlled media. Foreign newspapers and periodicals are forbidden. North Koreans are not free to travel within the country without government permission. Foreigners who visit North Korea are carefully controlled by their (two) minders who keep them from interacting with the North Korean populace. In short, North Korea has traditionally viewed controlling the flow of information to its population as a fundamental necessity to ensure the survival of the state. It is surprising then to see that the North Korea state has sanctioned the use of cell phones and other information technology. There are now more than 1 million third-generation cell phones in North Korea, as part of the Koryolink cell phone system. These phones can call other members of the Koryolink network, but cannot make calls outside of the country. There is also a state sponsored intranet in North Korea, called Kwangmyong. 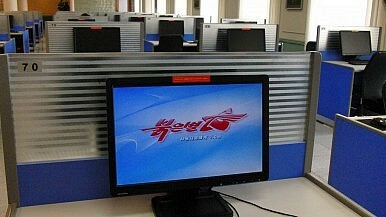 The intranet is restricted to elites in North Korea with good social standing. The intranet features message boards, chat functions, and state sponsored media; its use has also been encouraged among university students, technical experts and scientists, and others to exchange information. A few North Koreans have access to the unfiltered Internet. Andrei Lankov, a leading North Korean expert at Kookmin University in Seoul, estimated this number to be “a few dozen families” including Kim Jong-Un’s clan. Other select North Koreans may have restricted and/or monitored access to the Internet to gather data on the U.S. and South Korea, find content to populate the intranet, and maintain the North Korean government’s propaganda web sites. Surveillance cameras at internet cafés, harsh accountability standards for webmasters and the specter of self-censorship have many questioning the future of Internet freedom.